In some winters there is a shortage of subject matter. This Toronto winter hasn’t given us any significant winter scenery. One way to deal with “subject drought” is to: try new creative approaches, way outside the old box. This may not be as productive but we stay sharp and we prevent the shutter from rusting. We may actually invent something new, something we might not notice when things are green and in bloom. 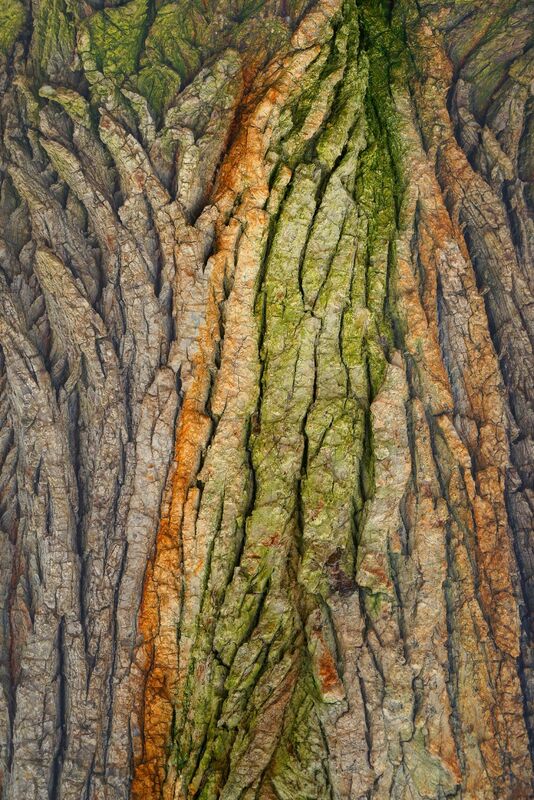 Tree bark? Sure, why not. This image was made in Lambton Woods, Toronto. Camera: Sony ILCE-7R, f22, 0.3 sec, 200 ISO, tripod. In post-production the image was first flipped vertically, then horizontally. The dominant green discolouration now led from left bottom towards right top. Then the saturation was increased across the board by 15. Then a Fractalius 2 filter was applied, pre-set: ‘Lines’ 1, then this was reduced to 10 % of the final image. Finally the image was sharpened.